Introduction: This is a special edition of the annual “In the footsteps of van Leeuwenhoek course”. Molecular complexes play an important role in the functioning of cells. Multiple proteins will form complexes to regulate cr ucial cellular processes like transcription, receptor signaling and cytoskeletal structure formation. The misfunction of the individual protein components and their interplay may result in disease. Uncontrolled formation of protein complexes plays a crucial role in the development of Huntington and Alzheimer neuronal disease. 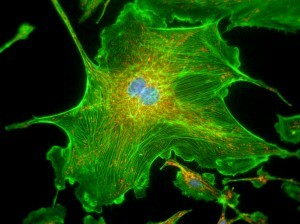 Microscopic techniques can be used to elucidate complex composition, organization and dynamics, as this reflects the functions of cells and their organelles. Because of the recent technological revolution in advanced light microscopy (i.e. super-resolution imaging, functional imaging of molecules) it is now possible to directly monitor the dynamics of (single) molecules in living cells. Several new microscopy techniques are ideally suited for studying molecular complexation but their application remains limited because most biologists have never been introduced to these technologies. This practical advanced course will be organized to provide students in this field the theoretical background and give hands-on experience of state-of-the-art microscopy techniques.